Did you know 1 in 133 Americans are diagnosed with Celiac Disease according to Celiac Central, leaving those with gluten intolerance in an on-going battle to find truly gluten free options for breakfast, lunch, dinner and everything in between! Artisan Bistro offers a range of passionately-crafted, globally-inspired breakfasts, burritos, bowls, entrées and more made by artisan chefs, all crafted with a savory blend of 70 percent or more organic ingredients and sustainable proteins. Check out some of the products below that the company has to offer. 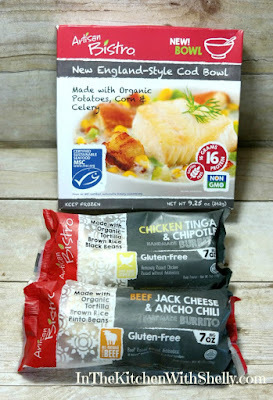 Seafood Bowls – the first entrée frozen food line in North America to earn Marine Stewardship Council ecolabel certification for sustainable, wild-caught seafood that touts wild-caught Alaskan salmon and cod, and wild pink shrimp. Available in 4 flavors. Burritos – Featuring a savory blend of high-quality sustainable proteins, organic vegetables, grains and spices all wrapped in a one-of-a-kind organic gluten-free tortilla, for an elevated south-of-the-border lunch, dinner or snack. Available in 4 flavors. Beyond Breakfast – Available in three vegetarian options and two varieties with all-natural turkey, these satisfying entrées blend the flavors of hearty breakfast favorites and can be enjoyed for breakfast, as a light lunch or a nutritious snack. Available in 4 flavors. Recently we were sent three items from Artisan Bistro to try out for all of you. I am admitting up front, I don't personally have a problem with gluten being in my diet but my husband has developed a gluten intolerance over the past few years. We are contributing it to the aging process since he never had a problem until he was in his late 40's. 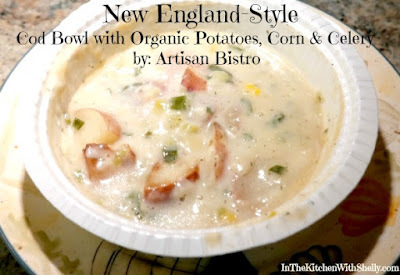 Last week for lunch I made him the Artisan Bistro New England-Style Cod Bowl for lunch. You can make this in your microwave oven which takes approximately 5-6 minutes or in your conventional oven which takes 35-40 minutes. I chose to make it in my microwave oven and followed the package instructions. The Artisan Bistro New England-Style Cod Bowl is made with wild-caught cod (fish), organic potatoes, organic corn and organic celery. It's a one-serving bowl and each serving contains 16 grams of protein and 180 calories which makes it great for those who are watching their weight. My husband was really impressed with this cod bowl and gobbled it down in rapid fashion. He couldn't believe that this was a prepared frozen meal and came out of our microwave oven. He has already added more of these to our grocery shopping list. A few days later we made the 2 burritos that were sent to us for the review and prepared both of them using our microwave oven. My husband enjoyed the Chicken Tinga & Chipotle Burrito and I enjoyed the Beef Jack Cheese & Ancho Chili Burrito. These burritos were delicious and had the perfect combination of flavors. What we also enjoyed abotu them is that they weren't hard & crunchy or soggy. Most of the time when you buy frozen burritos they either come out too crunchy or too soggy. The texture with both of these was spot-on perfect! We will definitely be buying more of the Artisan Bistro products the next time we do our grocery shopping. You can learn more about the company and all of the different products that they make by visiting their site online.